Danny Lennon has secured the signing of the 21-year-old on a two-year contract. 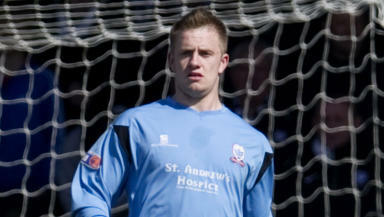 St Mirren have completed the signing of goalkeeper Grant Adam on a two-year contract. Adam has been on trial at the Paisley club in recent weeks and was handed a chance to show what he could do in a friendly on Tuesday evening against Dumbarton. Saint manager Danny Lennon had said that he had been impressed by the former Rangers, Forfar and Airdrie goalkeeper but had admitted that a tight budget may have hindered his chance to complete a deal. "I’ve always said we won’t go outwith our means,” Lennon said on Tuesday. “We value Grant and he’d give us a good option but we are in a financially uncertain period." Now, a deal has been agreed that will make Adam a Saints player until the summer of 2014. The keeper will now challenge established first choice Craig Samson for a first team place. Adam left Rangers in the summer, having failed to make a top team appearance for Ally McCoist’s side. He made 14 appearances in a loan spell at Airdrie United towards the end of the 2011/12 season, while also featuring in the national setup for Billy Stark’s Scotland Under-21s against Italy in April.